With a volunteer force numbering more than 1,200 and the support of a concerned public, The Marine Mammal Center is able to respond to marine mammals in distress. Covering a rescue range that spans 600 miles of California coastline and the Big Island of Hawai‘i, the Center responds to more stranded marine mammals than any other organization in the world. Sick and injured animals are treated and rehabilitated at our state-of-the-art veterinary facilities where we care for our patients until they can be released back to their ocean home. Our sought-after experts are deployed locally and internationally to provide technical veterinary expertise and training on best practices ranging from anesthesia to disentanglement. Since 1975, we've rescued more than 22,000 marine mammals, and thanks to people like you who call our rescue lines, we're able to give these animals a second chance at life. The Marine Mammal Center's rescue range extends along 600 miles of central and northern California coastline from San Luis Obispo through Mendocino counties. We also respond to Hawaiian monk seals on Hawai‘i Island. You can make a difference for a marine mammal in distress by following a few simple steps. Over four decades, our animal care standards have evolved to lead the industry in best practices. And we continually adapt our treatment based on our scientific findings to give our patients the best chance at survival. From seals to sea lions to sea otters, check on the status of the patients in our care at our hospitals in California and Hawai‘i. Learning from every animal we respond to, the Center a major contributor to the global body of research and knowledge about marine mammal medicine and health. 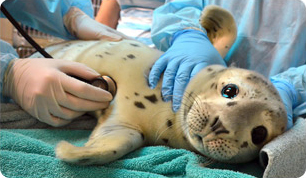 As a member of the Oiled Wildlife Care Network in California, our hospital is a primary facility for oiled seals and sea lions, and our staff and volunteers are specially trained to assist if called upon during an oil spill event. Curious about how we rescue, rehabilitate and release marine mammals back to the wild? Here are some commonly asked questions about our life-saving work. We’re working to save the endangered Hawaiian monk seal at our hospital in Kailua-Kona, on the Big Island of Hawai‘i. None of this life-saving work is possible without support from people like you. Find out how you can get involved and make a real difference for our patients and our global mission.